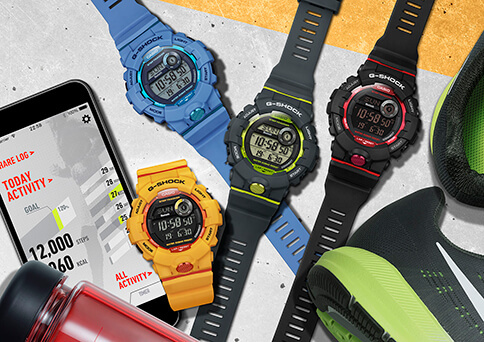 Casio G-Shock is adding an all-new model to the fitness-oriented G-SQUAD lineup with the addition of the GBD-800. 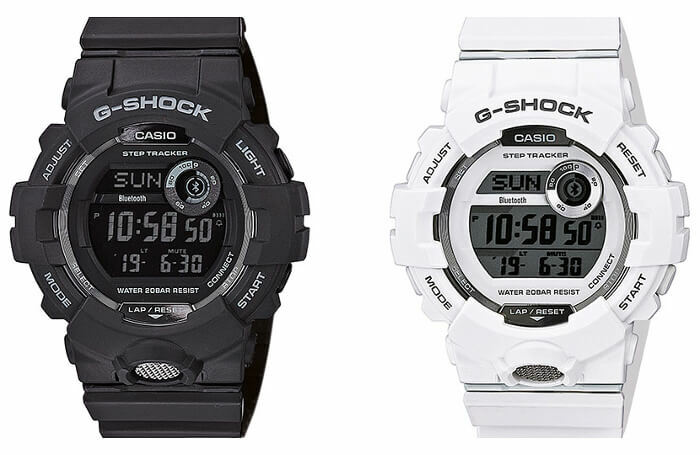 The G-Shock GBD-800 is a digital-display model with the same mid-size exterior case and dimensions as the original analog-digital G-SQUAD GBA-800. Like the original, the GBD-800 has the Step Tracker pedometer and the Bluetooth Mobile Link features. With its smaller size relative to other G-Shock models and unisex colors, the GBD-800 is recommended for both men and women. Women who desire a smaller watch with the same features should also look into the Baby-G BSA-B100. Update: Casio America announced the GBD800-1 and GBD800-8 for October 2018 with a list price of $99 USD each. Update 2: G-Shock Japan announced the black GBD-800-1 BJF and white GBD-800-7JF for October 2018. The G-Shock GBD-800 has unique fitness features for those looking to be more active as well as for serious athletes in training. The Step Tracker feature uses a three-axis acceleration sensor. With the G-Shock Connected app, a linked smartphone displays the step count, calorie expenditure, target achievement rate towards a settable daily step goal, exercise intensity, and a step number graph display. The stopwatch has a 200-record memory (including month, day, hour, minute, wrap/split time) and a settable target time notification function (up to 10). Up to 5 interval timers can be set (between 1 second to 60 minutes) to automatically repeat up to 20 times. Bluetooth Mobile Link also allows for automatic time syncing four times a day, adjustment of the dual time with 300 cities, a phone finder function, and easy settings adjustment. Other features include shock resistance, 200-meter water resistance, dual time, 5 alarms, auto LED Super Illuminator light with afterglow (1.5/3 seconds), and an estimated 3-year battery life. The GBD-800-1JF, GBD-800-2JF, GBD-800-4JF, and GBD-800-8JF are scheduled for a 14 September 2018 release in Japan with a list price of ¥13,500 JPY each.